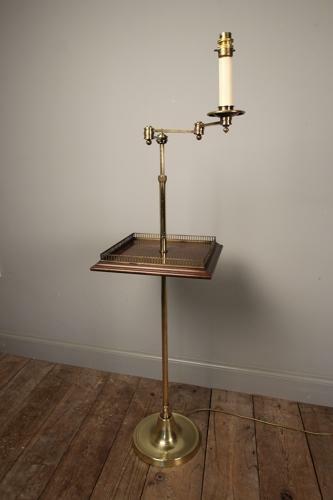 A highly stylish mid century adjustable brass floor lamp table, having a brass galleried Mahogany top, in superb condition throughout. English, Circa 1950. Dimensions: Minimum Height: 122 cm - (48 Inches), Maximum Height: 152.5 cm(60 Inches), Depth/Width: 33 cm - (13 |Inches) Square.